Leber congenital amaurosis (LCA) and early-onset severe retinal dystrophy (EOSRD) are both genetically and phenotypically heterogeneous, and characterised clinically by severe congenital/early infancy visual loss, nystagmus, amaurotic pupils and markedly reduced/absent full-field electroretinograms. The vast genetic heterogeneity of inherited retinal disease has been established over the last 10 - 20 years, with disease-causing variants identified in 25 genes to date associated with LCA/EOSRD, accounting for 70–80% of cases, with thereby more genes yet to be identified. There is now far greater understanding of the structural and functional associations seen in the various LCA/EOSRD genotypes. Subsequent development/characterisation of LCA/EOSRD animal models has shed light on the underlying pathogenesis and allowed the demonstration of successful rescue with gene replacement therapy and pharmacological intervention in multiple models. These advancements have culminated in more than 12 completed, ongoing and anticipated phase I/II and phase III gene therapy and pharmacological human clinical trials. This review describes the clinical and genetic characteristics of LCA/EOSRD and the differential diagnoses to be considered. We discuss in further detail the diagnostic clinical features, pathophysiology, animal models and human treatment studies and trials, in the more common genetic subtypes and/or those closest to intervention. LCA was first described by Theodore Leber in 1869 and is now used to describe a group of severe recessively inherited, early infantile onset rod–cone dystrophies.5 In 1916, Leber described what he considered a milder form of the same disease6 which has had several names, including EOSRD, severe early childhood-onset retinal dystrophy (SECORD)7 and early-onset retinitis pigmentosa. Whereas LCA is congenital or presents within the first few months of life, is associated with nystagmus, poor pupil responses and in most instances an undetectable full-field electroretinogram (ERG); EOSRD/SECORD is defined as a severe retinal dystrophy presenting after infancy and usually before the age of 5 years. Other distinguishing features of EOSRD/SECORD include better residual visual function and small ERG signals, particularly for the lesser-affected photoreceptor system. Of note, there is significant overlap between the molecular causes of LCA and EOSRD, with some genes causing both clinical phenotypes. However, certain genes are more frequently associated with LCA, for example, GUCY2D, NMNAT1, CEP290 and AIPL1, whereas mutations in others including RPE65, LRAT and RDH12, more commonly result in an EOSRD phenotype. Spatial representation of expression of LCA/EOSRD genes, grouped according to their proposed function. EOSRD, early-onset severe retinal dystrophy; LCA, Leber congenital amaurosis. Given recent advances in understanding of the molecular basis of these disorders and the ongoing clinical trials of novel therapies, we herein review the clinical characteristics, animal models and pathophysiology of LCA/EOSRD, prioritising the more common genotypes and/or those closest to intervention. Colour fundus photographs of patients with recognisable LCA/EOSRD clinical phenotypes. (A) RPE65-retinopathy, associated with a blonde fundus, peripheral, white punctate lesions and normal central macular appearance in keeping with central preservation of outer retina. (B) CRB1-retinopathy characterised by nummular pigmentation, periarteriolar sparing of the RPE and macular atrophy. (C) RDH12-retinopathy with characteristic dense intraretinal pigmentation and macular atrophy with pigmentation and yellowing. EOSRD, early-onset severe retinal dystrophy; LCA, Leber congenital amaurosis; RPE, retinal pigment epithelium. The identified genes account for approximately 70%–80% of LCA/EOSRD cases (table 1, figure 1 and below), with GUCY2D, CEP290, CRB1, RDH12 and RPE65 being the most common.9 16–19 It has been possible to identify certain characteristic associated phenotypes (figure 2 and below): RDH12-associated disease, which gives rise to an EOSRD phenotype is characterised by early-dense intraretinal pigment migration pigmentation and maculopathy. CRB1-associated disease has nummular pigmentation, maculopathy, relative preservation of para-arteriolar RPE, with retinal thickening and loss of lamination on optical coherence tomography. TULP1, AIPL1 and NMNAT1-associated disease are also characterised by maculopathy which in the case of patients with NMNAT1 mutations is of early onset and extensive. Most cases of LCA/EOSRD occur in otherwise normal infants and any non-ocular symptoms or signs should be investigated for syndromic retinal dystrophies or neurometabolic disease, usually in conjunction with a paediatrician. Renal involvement (nephronophthisis which can lead to end-stage renal failure) may be seen in some genetic subtypes of LCA/EOSRD (eg, IQCB1, IFT140 and CEP290) as part of syndromes including Senior-Loken Syndrome and Joubert Syndrome.20–22 Early molecular diagnosis can help prioritise which children should have ongoing systemic investigations. The differential diagnosis of an infant with severe visual loss and nystagmus is broad and includes both syndromic and non-syndromic diseases (table 2). Conditions that are important to be distinguished from LCA/EOSRD include complete and incomplete Achromatopsia, S-cone monochromatism, complete and incomplete congenital stationary night blindness and albinism; however careful examination and detailed investigation including electrophysiology usually allow an accurate diagnosis to be established. Molecular genetic testing may then allow a more specific diagnosis (table 2). Disease mechanisms and interventional approaches have been explored in several animal models of GUCY2D-LCA. Initially, gene replacement was investigated using an HIV1-based lentiviral vector in a naturally occurring chicken model and showed improved optokinetic reflexes and volitional visual behaviour.28 Subsequently, multiple groups have had therapeutic success in engineered mouse models. Both adeno-associated virus serotype 5 (AAV5) and recombinant adeno-associated virus serotype 2/8 (AAV 2/8) vectors carrying animal and human complementary DNA (cDNA), respectively, have been shown to rescue retinal function and preserve cone photoreceptors in RetGC1 knock-out mouse models.29–31 Moreover, an AAV8 based-gene replacement therapy, using the tyrosine capsid mutant AAV8(Y733F), has been shown to restore both useful cone and rod-mediated vision in a RetGC1/RetGC2 double knock-out mouse.32 These successful animal studies combined with the relative outer retinal preservation observed in patients with GUCY2D-LCA has resulted in advanced preparation for a human gene therapy trial. RPE65-associated LCA/EOSRD accounts for approximately 5%–10% of cases and has been the subject of the most clinical trials to date.9 RPE65 encodes a 65kD retinoid isomerase expressed in the RPE; a critical component of the retinoid (visual) cycle.33 34 As such, patients with RPE65 deficiency have a lack of 11-cis-retinal. Most children with RPE65 deficiency have an EOSRD phenotype with profound night blindness from birth but residual cone-mediated vision and often mild if any nystagmus. It has been suggested that cone photoreceptors have an alternative supply of 11-cis-retinal independent of RPE65, thus allowing cone-mediated vision in younger patients.35 However, due to the 11-cis-retinal deficiency in rod photoreceptors there is early and profound nyctalopia. Acknowledging the known impaired structural properties of the visual pathway observed in visually deprived animals51 and blind human studies,52 Ashtari et al investigated the plasticity of the visual system following retinal gene therapy in patients with RPE65-LCA using non-invasive multimodal neuroimaging.53 They reported improvements and normalisation in the visual pathway corresponding to the retinal injection areas in the treated eyes, which were maintained over time, compared with the visual pathway for the untreated eyes which continued to deteriorate. This would support the belief that early intervention would be most likely to result in the greatest benefit. However, of note the 10 subjects in this study were aged 9 to 45 years, suggesting that intervention in adulthood could still be beneficial. Furthermore, recently, one phase III trial (NCT00999609) and a phase I/II trial (NCT01496040) have been completed with another two phase I/II trials (clinicaltrials.gov identifiers: NCT02781480, NCT00821340,) now underway. Pharmacological intervention has also been investigated to potentially overcome the biochemical blockade, following successful rescue in animal models.54 55 A phase I/II clinical trial examining the efficacy of the synthetic prodrug QLT091001, a precursor to 9-cis-retinal, has been conducted in 18 patients (13 with RPE65-LCA and five with LRAT-LCA—as both encoded proteins participate in the retinoid cycle (figure 1)).56 Patients received a once-daily oral dose of 40 mg/m2/day for 7 consecutive days. Following this, 44% of patients had a >20% increase in isopter area in one or both eyes, as assessed by Goldmann visual field testing, and 67% of patients showed a>5 ETDRS letter score increase in one or both eyes.56 A phase III trial is due to commence in the near future. Gene replacement therapy using an AAV2/8 vector in an AIPL1 knock-out mouse model has been shown to result in restoration of cellular function with photoreceptor cell preservation and improved retinal function, despite the severe rapidly progressive early-onset retinal degeneration seen in this mouse model.62 The early visual loss to perception of light or worse, the high-resolution OCT evidence of retained outer retinal structure early in life and the successfully treated animal models, raise the possibility of a gene therapy-based approach in AIPL1-LCA early in life; with a human clinical interventional study being in the advanced stages of development. In contrast to other forms of LCA, RPGRIP1-LCA appears to be relatively non-progressive, following an initial rapid decline in visual function.18 Furthermore, photoreceptors in the central retina appear to remain present for a significant period following deterioration of visual function.70 These features suggest a wide window of opportunity for potential intervention. Disease-causing sequence variants in CRB1 have been identified in a broad range of phenotypes, including the early-onset disorders LCA/EOSRD and retinitis pigmentosa with and without a Coats-like vasculopathy, a later-onset macular dystrophy and isolated autosomal recessive foveal retinoschisis.74–77 Approximately 10% of LCA/EOSRD patients harbour variants in CRB1.9 18 The CRB1 protein is known to colocalise with the zonula adherens, forming a major component of the outer limiting membrane and is believed to have a role in retinal development. Both the severity and rate of progression vary significantly between patients with CRB1-associated LCA/EOSRD, with clinical examination and OCT findings often allowing directed molecular screening of CRB1.74 75 78 Characteristic findings include macular atrophy, nummular pigmentation, relative para-arteriolar preservation of the RPE and retinal thickening with loss of lamination—in direct contrast to other forms of LCA/EOSRD where progressive retinal thinning is commonplace. LRAT encodes Lecithin:retinol acyl transferase, a key enzyme in the vitamin A recycling pathway (visual cycle), with LRAT deficiency associated with a similar phenotype to RPE65-deficiency, although being far less common.9 88 As described for RPE65-deficiency, the synthetic prodrug QLT091001, a precursor to 9-cis-retinal, has been shown in a phase I trial to improve VA and kinetic visual fields in LRAT-LCA, with a phase III trial anticipated in the future. Stem cell therapies hold great promise for the future to restore lost retinal cells in advanced disorders, including potentially LCA. At present, human stem cell therapy has primarily been confined to RPE transplantation, with two phase I/II studies reporting safe transplantation of human embryonic stem cell-derived RPE and induced pluripotent stem cell-derived RPE, respectively.89 90 However, transplantation of other retinal cells, including photoreceptors—which would be needed in LCA, remains at a preclinical stage. Improvements in molecular genetic testing and clinical assessments (primarily quantitative high-resolution retinal imaging) have led to a greater understanding of genotype–phenotype correlations and structure–function associations in LCA/EOSRD. This coupled with advances in gene therapy in both animal model studies and human clinical trials have resulted in a current new era of increasing clinical trials for multiple genetic subtypes of LCA/EOSRD and the cautious optimism for the development of proven successful and durable treatments which both improve visual function and halt/markedly slow retinal degeneration. Substantial challenges remain however, particularly for patients with severe visual loss from birth where normal visual pathway function has never been established, with intervention likely needed very early in infancy to fully address any potential cortical limitations and thereby optimise outcomes. The authors wish to thank Melissa Kasilian who assisted with the figures.
. In. Saemish T , ed. Graefe Handbuch der gesamten Augenheilkunde. 2nd ed. Leipzig, Germany: W. Engelman, 1916:1076–225.
. The natural history of Leber’s congenital amaurosis. Age-related findings in 35 patients. Ophthalmology 1992;99:241–5.
. RDH12 retinopathy: novel mutations and phenotypic description. Mol Vis 2011;17:2706–16.
. 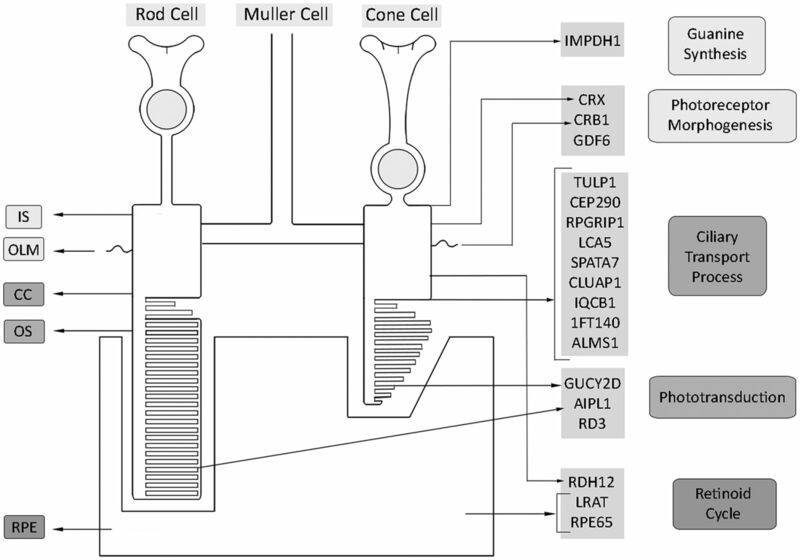 Identification of the RPE65 protein in mammalian cone photoreceptors. Invest Ophthalmol Vis Sci 2002;43:1604–9.
. Retinal degeneration 12 (rd12): a new, spontaneously arising mouse model for human Leber congenital amaurosis (LCA). Mol Vis 2005;11:152–62.
. Electroretinographic analyses of Rpe65-mutant rd12 mice: developing an in vivo bioassay for human gene therapy trials of Leber congenital amaurosis. Mol Vis 2007;13:1701–10.
. RDHs) in the visual cycle. Experimental eye research 2010;91:788–92.
. AAV-mediated expression of human Rdh12 in mouse Retina. Investigative Ophthalmology & Visual Science 2012;53:1916–16. Contributors NK drafted the manuscript and provided critical revision. MM conceived and supervised the manuscript and provided critical revision. ATM and RGW provided critical revision of the manuscript. Funding Supported by grants from the National Institute for Health Research Biomedical Research Centre at Moorfields Eye Hospital National Health Service Foundation Trust and UCL Institute of Ophthalmology (UK), Fight For Sight (UK), Moorfields Eye Hospital Special Trustees (UK), Moorfields Eye Charity (UK), the Foundation Fighting Blindness (FFB, USA), Retinitis Pigmentosa Fighting Blindness (UK), and the Wellcome Trust (099173/Z/12/Z) (UK). Michel Michaelides is a recipient of an FFB Career Development Award. Disclaimer The funding organisations had no role in the design or conduct of this research.